This is a game of racing chariots like in the Circus Maximus in ancient Rome. The game uses a plotted impulse based movement system similar to that in the game Star Fleet Battles or Car Wars. This game is about racing, not combat. The recent update (2/9/2004) of the ruleset on the BigBoard adds some optional combat-like actions. The following diagram is the board made from grid-side up tiles. The hardest part of designing this game was coming up with a good oval track. The final track is the sixth or seventh track layout I tried. After the track and deciding to use a pre-plotted impulse based movement system, the rest of the game fell out very easily. My original idea for the HistoryRepeatsItself contest was a game about the original Greek Olympics. It was going to be a series of mini-games representing different events. This game was the developed from the running event. I ran out of design and playtest time, and so took the most completely developed part and re-glossed it as chariot racing. I believe that it turned out to be a better game for it. Comments from the contest judge Rob LeGood. The runner up is a very enjoyable racing game called Chariots . This is a beer and pretzels games with some interesting mechanisms. Movement resolution is inspired by the Starfleet Battles method of movement of dividing turns into "Impulses". If you've never seen this, read the rules and you'll see what I mean. It's quick to learn and fun to play and had the group asking to play more once it was over. For me, what kept it out of first place was that it quite didn't go far enough. During each lap you get two special actions to use which are Chariot racing themed. I would have loved to seen more of these. Basically, it felt like you could put any theme on this game and it would still be the same game. I would have liked to see more special actions added to the game to make it feel more Chariot like. I strongly recommend the author to take the game away and expand it. You have a potential sleeper hit on your hands! Good job! While sitting around recovering from jet-lag last night, I persuaded my brother and brother-in-law to play Chariots, a piecepack game. It was the simplest of the piecepack RecommendedGames that I want to try on this trip, so it fitted our mood. Chariots has some interesting mechanisms. It uses simultaneous action selection, borrows the impulse movement system of Car Wars and adds some clever cornering rules. Mark Biggar has compressed the game elegantly into the confines of the piecepack. We played a three-lap race, which was plenty. I won by about six squares, due to some lucky rolls and managing to stay out of the dog fight the others got involved in. We enjoyed the game. I gave it a 5, which is perfectly acceptable by my ratings. My brother-in-law gave it a 6 and my brother a 7. I do have some quibbles with Chariots, but these are easily fixed. I think it will only really play well with four players. It was just about OK with three, but it would be terrible with two. This is because the fun lies in trying to squeeze the other competitors out of the inside track and trying to force them to crash. It might be worth taking the central column of tiles out of the straight the next time we play with three, in order to compress the interest of jockeying around the corners. The impulse movement system worked well, but could be a bit slow. For speed, it might be better if the rules explicitly stated that if someone is more than about two spaces from any other players that they can take a phase’s movement in one go, without worrying about separate impulses. I only had one rules question. The rules don’t specify who decides which space a chariot goes into if they are pushed aside by an ace coin. We assumed it was the player who is doing the pushing, but it could be the pushed player. It might be more fun if this was somehow randomised with a dice roll. It struck me while playing this how attractive my Mesomorph piecepack is. The wood feels and looks beautiful and the deep colours of the pawns are very striking. I have never played a piecepack game that used dice before and it was fun to shout "null point" every time someone screwed up a cornering roll with a null - only Europeans will understand that reference. This was a successful start to our holiday gaming. It’s a good omen. Session report by RonHaleEvans from his Seattle Cosmic gaming group. The second piecepack game of the evening was Chariots by Mark Biggar. I played it with John Braley and Dave Howell. Dave immediately recognised the "impulse" movement system of Chariots as being similar to Car Wars, although (he said) the order in which players moved was closer to Ben Hvrt (another chariot race from Cheapass Games). Since Dave had played this kind of game before, while John and I hadn't, Dave acted as a sort of gamemaster, counting out the impulses and stating who had to move next. As in a lot of race games (including Backgammon), there is a fair amount of blocking. My strategy was to play high numbers in the corners, even at the risk of crashing, and hope that by going around the outside of the track as quickly as possible, rather than slowly around the inside, I could catch up. Although I never crashed, my strategy failed; I came in third of three (but only by one space). 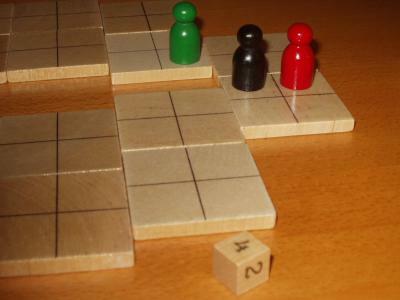 Dave and John adopted more conventional "blocking game" rather than "running game" strategies and stuck to the inside of the track. We were all neck and neck until Dave pulled ahead on the first curve in the second lap, and slowly increased his lead from then on. At the end of the game, Dave was five or six spaces ahead, and I was one space behind John. John probably would have done a little better but had several lousy die rolls. He thought that dice played too large a part in the game and came up with a splendid suggestion for a new piecepack component: piecepack dice cards, along the lines of the Deck of Dice. Seattle Cosmic uses these frequently for Settlers of Catan, and they reduce hurt feelings over bad die rolls considerably. One problem we had while playing Chariots, although we had fun, was that it was hard to discern certain features of the board, such as the finish line, and especially where the insides and outsides of the turns were. Dave said this was a problem that came from playing with a generic game system, and that if he played it again, he would make his own board with these features clearly marked. I said that it is a recent trend for piecepack rulesets to include printable playmats, and that two letter-sized sheets placed under the board would be sufficient. John suggested that dry-erase markers could be used on the wooden tiles to highlight the areas of the board, but you'll do that to my piecepacks when you pry them from my cold, dead fingers, etc. By the way, this was the first time John and Dave had seen the third-edition Mesomorph piecepacks, and John asked whether people might lose an eye during flicking games when pieces shot off the table because of the new super-slick coating. "The guys weren't too interested to play another game of Hanging Gardens and we tried Chariots. We weren't quite satisfied with the game. The impulse system was complicated, the use of special tokens was unclear (I still don't know how and when they are used) and it felt like there was nothing to do to stop the leader. The starting order was Ilari, me and Juho and that was how it was, during the whole race. Ilari won, then me, then Juho. With four players and more special actions to use, the game might be more interesting. Then it becomes more complicated... I don't know, this might be worth trying again anyway."